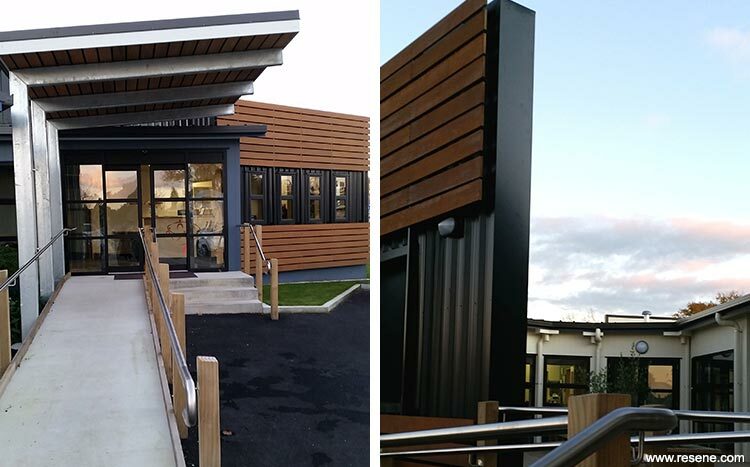 A site-wide redevelopment for Patricia Ave Special Needs School in Hamilton included a new Hub with administration and multipurpose space, areas for physio therapy, classrooms which face green spaces, better indoor/outdoor flow, secure access, and an increase of full care bathroom facilities, a sensory room, music room and professional library/resources spaces. The overall design objective was to establish a specialist teaching hub to support the network of special schools in the Waikato region and it integrate the school’s requirements with the New Zealand Curriculum objectives. The design needed to provide a supportive modern learning environment specifically appropriate for children of special needs, encouraging reflective thought and actions and providing sufficient opportunities to learn. It also needed to provide an efficient hub for the itinerant teachers servicing the school and its satellite sites, create a cohesive teaching hub that links the school environment, be an attractive design that appeals to students, staff and the community, while meeting health and safety requirements and energy efficiency in design. Gisler Architects’ design was creating innovative architectural outcomes, which allow students and staff to reach their greatest potential; stimulating school environments, for users to work and learn in. They worked closely with the Ministry of Education and the school’s Board of Trustees to provide modern facilities that exceed the stated guidelines for students, staff, provision of the curriculum, special needs, technology and health and safety. The juxtaposition of the black metal cladding and the clear stained cedar panels creates a striking effect, while the blue Resene Rhino allows a balance and classic touch. This effective colour combination both blends and inspires the warmth of the natural timber and the hard black of the metal cladding. The Resene True Blue on the fascia board adds a pop of colour against the roofing material and the sky. The main school is painted in Resene Wheatfield which is a warm neutral with depth and clean results with Resene Eighth Wheatfield on soffits. This ties together the new and old buildings and the differences in cladding materials. Resene Lumbersider in Resene Half Milk White was used for all exterior painting which included concrete block work, timber weatherboards over existing paint, new timber boards, Hardiflex® soffits and Axon® board. The cedar timber boards on the rain screen frame were stained with Resene Waterborne Woodsman. Internally Resene Lumbersider was used on plasterboard linings and a Resene clear finish on solid clear timber trims. One unexpected issue was the metal filings from the rain screen frame reacting with the fixings and staining the cedar boards. All boards were removed and sealant applied between frames and fixing. All cedar boards were sanded back and restained. This resolved the staining issue.